On February 9-10, 2012 the International Contact Group on the Great Lakes Region will meet at the Department of State in Washington, DC. This body, consisting of the United States, United Kingdom, France, Belgium, the European Union, and the United Nations, aims to meet on a quarterly basis and has been convened regularly since the early 2000s. The Contact Group works to address political, diplomatic, security, and development issues in the region, and since 2008 has included a task force focused on the illegal trade in natural resources. The intention of the group is to act as a medium for regular exchange of information, the harmonization of messaging, and for the identification and discussion of gaps that exist in regional foreign policy among the members of the group. The group originally included regional countries such as Angola and South Africa, but over the years has slimmed down to its current members that now act as a North American – European alliance on development, security, and economic diversification in the Great Lakes Region. The Contact Group has a unique ability to advance a coordinated regional policy from all members based on the collective knowledge the group brings to the table. The Group tends to meet just below the ministerial level, occasionally receiving participation from senior principals, and in general allowing for interaction among working level and deputy assistant secretary level and equivalent representatives. This framework is beneficial in that it engages those who have an in depth working knowledge of the issues and situations on the ground. Ultimately, this allows those officials most responsible for crafting the nuts-and-bolts of policy to communicate and coordinate with their counterparts. The Great Lakes Contact Group is intended to compliment several of the field-based coordination mechanisms that exist among the members, such as the Ambassador’s Forum and the Tripartite-Plus Joint Commission, which brings together senior government officials not only from donor nations but also from Rwanda, Uganda, Burundi, and the Democratic Republic of Congo. However, since the Group is composed of policy experts who are able to influence their respective state or organizational policy platforms, it provides a real opportunity for improved coordination on international diplomatic engagement in the Great Lakes. To this end, the Group is perhaps one of the best-suited bodies to reform donor nations’ regional engagement as well as improve multilateral relations. 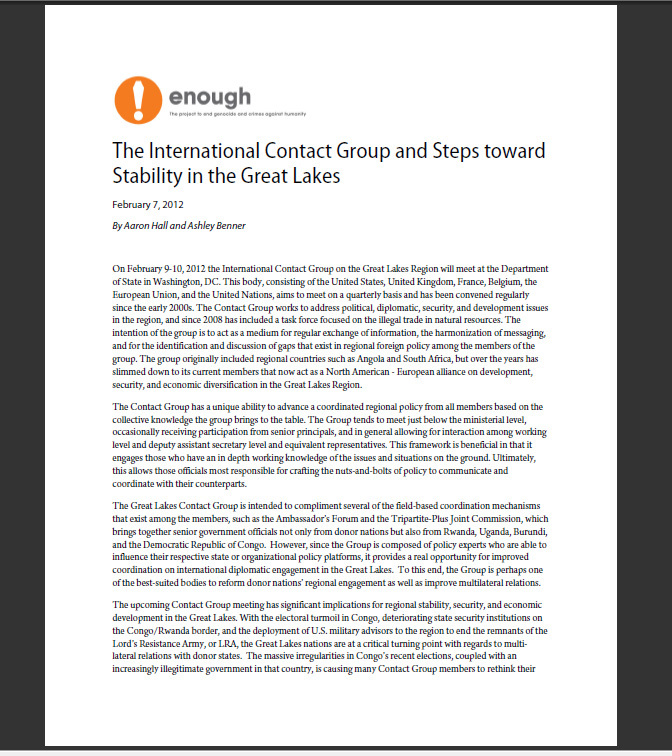 The upcoming Contact Group meeting has significant implications for regional stability, security, and economic development in the Great Lakes. With the electoral turmoil in Congo, deteriorating state security institutions on the Congo/Rwanda border, and the deployment of U.S. military advisors to the region to pursue the remnants of the Lord’s Resistance Army, or LRA, the Great Lakes nations are at a critical turning point with regards to multilateral relations with donor states. The massive irregularities in Congo’s recent elections, coupled with an increasingly illegitimate government in that country, is causing many Contact Group members to rethink their relationship with Congo with regards to assistance, development, and investment. In turn, this has implications for relations with other states in the region that have a history of acting as destabilizers on the Congolese political and security landscapes, such as Rwanda, Uganda, and Burundi. The upcoming meeting in Washington will focus on four urgent subject areas: the Congolese elections, security sector reform in Congo, conflict minerals, and armed groups and regional dynamics including the LRA. As a whole, these areas represent core impediments to peace, stability, and development in the Great Lakes. The following are recommendations to the group on specific elements of each subject area where this body can act to create real progress to mitigate conflict and fill critical gaps in cross-border coordination and communication.